For some time I have been planning to post the recipe of this egg curry, but incidentally either I was too busy to capture snaps or the snaps came too horrid to make a favorable impression on the readers that I withheld each time. Finally, last Sunday when I made this curry again, I wishing to click some nice, at least, presentable snaps under the daylight prettily organized the bowl containing the egg curry on our dining table nearby the window, but just when I was readying myself to take snaps, the Sun hid behind a puff of cloud without meaning to show up again, and my hopes were dashed when upon waiting for half an hour, it started raining. My enthusiasm ebbed away, I dropped the plan of taking any picture at all busying myself in serving lunch when my husband stepped forward managing to click some shots of the egg curry which although was somewhat dimmed by the absence of sufficient amount of light turned out to be decent enough for posting. 1. Don't stir after the eggs are dropped into the curry. 2. 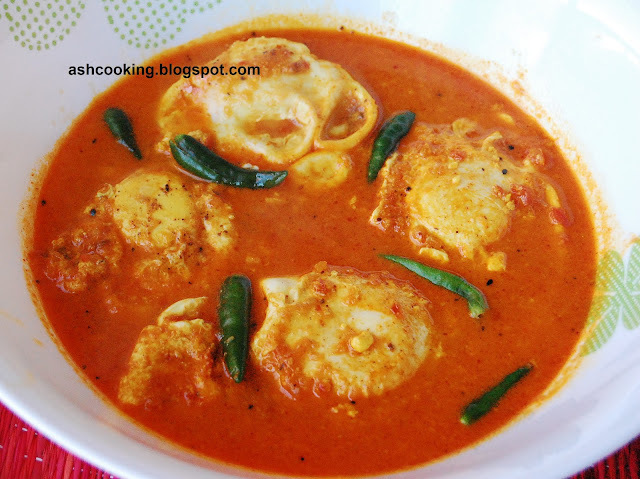 Break the eggs gently into the curry without upsetting the yolks. It will lose its essence then. 1) Heat oil in a wok. When oil turns hot, add panch phoron and allow sputtering. 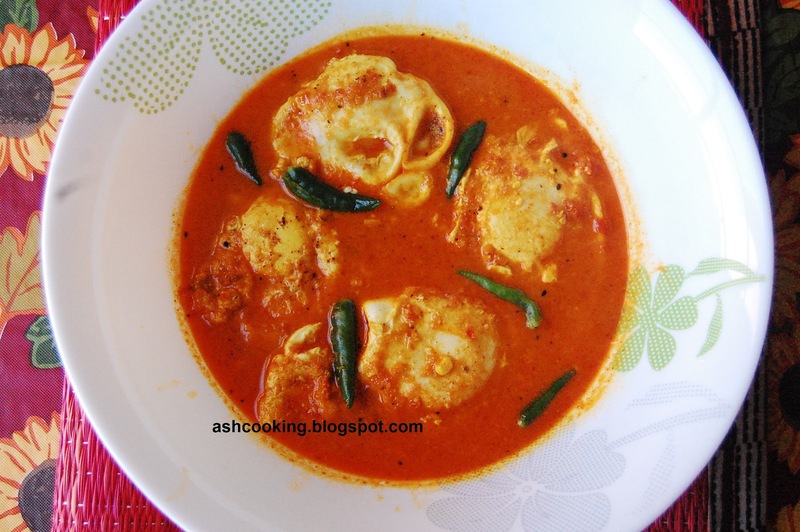 2) Add tomato puree, ginger paste, turmeric powder, cumin powder, coriander powder and kashmiri red mirch. Sauté for 5-8 minutes. 3) Measure out 1 cup of water and bring the gravy to a boil. Add yogurt and stir well to mix in. Add salt and green chillies. Simmer away the gravy for 2 minutes on medium heat. 4) Finally when the gravy has reached the desired consistency, break the eggs, one after another, into the curry without agitating the yolks. Don't stir. 5) Cook covered for 2 minutes till eggs solidify. Sprinkle a pinch of garam masala powder before turning the heat off.